You'll think you've departed Chicago and arrived in Scranton, Pennsylvania, when you walk into Replay Lincoln Park's new The Office pop-up bar, which officially opened its doors over the weekend. 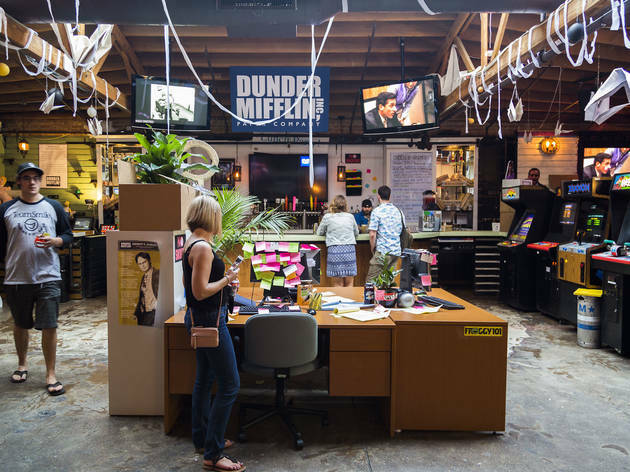 A section of the arcade bar received a 9-to-5 makeover, recreating desks belonging to Jim Halpert and Dwight Schrute, complete with desktop computers, Post-It notes and Froggy 101 bumper stickers (we didn't check to see if there's a stapler submerged in Jell-O in Dwight's drawer). 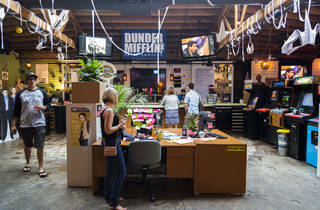 Throughout the pop-up, you'll find cardboard cut-outs of your favorite characters and walls peppered with references to specific episodes from the long-running series, including Michael Scott's $340 check to science, an "It is your birthday" banner and Pam's painting of the Dunder Mifflin office park. At the bar, you can order drinks inspired by the series, such as the One of Everything, featuring equal parts Scotch, absinthe, rum, gin, vermouth, triple sec and two packs of Splenda. Replay's The Office pop-up will be open for business through August 20, so stop by and put all of those Michael Scott quotes you've memorized to good use.